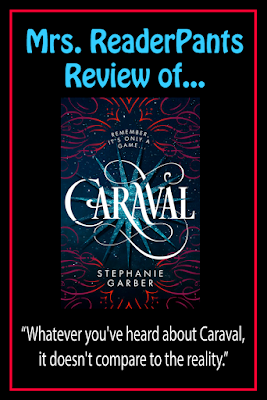 Caraval is a weird, twisty, wicked-fun must-read. Watch for this one on award lists--it's fantastic! SUMMARY: Scarlett and Donatella Dragna have lived in fear of their father's abuse all their lives. Scarlett plans to marry a stranger just to get herself and Donatella away from their father. In the days before her wedding, Scarlett and Donatella receive a coveted invitation to Caraval, a magical game where the winner gets one wish. REVIEW: Was this book weird? Totally and deliciously! It's weird along the lines of Alice in Wonderland or Charlie and the Chocolate Factory or even The Wizard of Oz. We have two sisters and a rogue sailor who "fall down the rabbit hole" into Caraval, a land where magic rules and nothing is as it seems. Along the way, one of the sisters--Donatella--is kidnapped and made the centerpiece of the game. The player who gets to Donatella first wins a wish from Legend, the creepy creator of the game. This book has everything: mystery, adventure, romance, illusions, fighting, murder, lies, beautiful dresses, and plenty of twists. Julian is a swoon-worthy love interest, and there's a nice little twist at the end as well. I especially love the way debut author Stephanie Garber weaves color and scent descriptions into everything--the clues, the facial expressions, the emotions. Scarlett hates plum purple because it's the color of her fear. Gold is happiness. Black, of course, is blood and death. Scarlett's father smells like lavender and anise. While inside Caraval, Scarlett wears a dress that constantly changes its color and form to reflect Scarlett's mood and feelings. Just gorgeous! Even though it's a January release, I have no doubt at all this book will make it on many "Best of 2017" lists. According to Ms. Garber's website, Caraval has already been optioned for a movie by Twentieth Century Fox. Awesome! THE BOTTOM LINE: A must for any library serving teens! Beautifully-written and super-fun! STATUS IN MY LIBRARY: On order. I can't wait to booktalk this one! This book is also mentioned in Podcast Episode 3: "10 YA Titles I Can't Wait to Read in 2017"
It's so awesome! Definitely worth a read!